West Palm Beach, FL – The South Florida Water Management District (SFWMD) Governing Board today approved a cooperative agreement with Lee County to take over maintenance of key natural waterways throughout the county. "Lee County asked for help to shore up its flood protection system, and this Board answered the call," said Governing Board Member Jamie Weisinger. "This District has the know-how, manpower and expertise to keep waterways clear and floodwater moving. Partnerships like this stress our commitment to working with counties, local drainage districts and homeowners associations to ensure all residents are protected for the next major rain event." Under the agreement, SFWMD will assume responsibility for clearing trees and other debris from 13 natural creeks and tributaries throughout Lee County. The District will coordinate with Lee County each year to determine which water courses on the list will be prioritized and addressed. 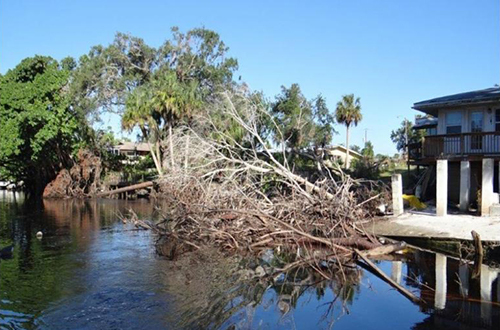 Keeping waterways clear of debris is a key component to providing flood protection as downed trees can clog canals and restrict the flow of floodwaters after a hurricane. SFWMD has been working with Lee County officials to create this cooperative agreement since Hurricane Irma caused flooding throughout the county in September 2017 in waterways not under the District's jurisdiction. After the storm, SFWMD stepped up to clear trees from a one-mile section of the Imperial River to help ensure flood protection for the Bonita Springs area.